Rarest of the rare!. Only 99 copies made in 1978. Few collectors even know about this one. This is some killer heavy fuzzed out guitar-laden hard rock proto-metal. Compared to the Pink Farries in Scented Gardens of the Mind but this has a much heavier early NWOBHM sound. Played only a few times. Cover has some creasing and minor wear. 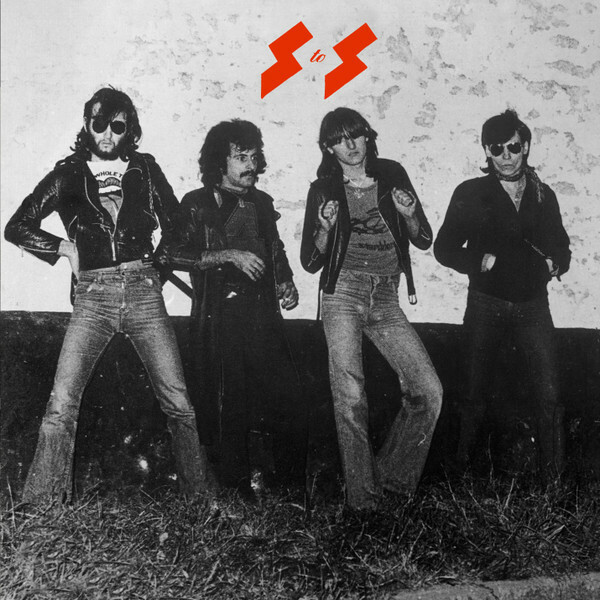 S TO S was a band who was operating from a town in the south-west of Belgium named Seraing. Both brothers Fluvio and Marco Cannella played the guitar and wanted to make songs who were completely ruled by their guitar-playing. Together with Picci on bass and George Abry on drums & vocals they recorded eight of their songs and managed to press a private record of it. The album itself got an initial pressing of 100 copies, as at that time they couldn’t afford more, but it never got a re-press. It was probably recorded in Michel Dickenscheid’s home-studio in Ougrée, as it was he who also helped out playing saxophone. All songs got really fast and furious guitar extravaganza. One guitar was playing the riffs while the other played along or played solo’s all over it. There was also one song named “I’m Fool” that sounds completely different than the rest. It was much slower and had a real mystic atmosphere around it, thanks to synths and a psychedelic sax blowing around, just like British rockers Hawkwind. What happened after the release of this remarkable record nobody seems to know. Only George Abry was seen playing the drums around the Liege-area, with local blues bands. Looking back at it now it seems that S TO S were ahead of their time playing such fast heavy rock in 1978; they just sound as a Black Oak Arkansas or Rory Gallagher album played at 45rpm! Other bands who were then playing fast with two guitars, as f.i. Judas Priest, simply didn ’t do it a whole album long. So this music certainly can be called pré-heavy metal as it was almost a year before the whole “NWOBHM” movement started in England. Lots of people regarded them as punks and maybe their attitude was really positive about that movement, but musically they really had nothing in common with that revolution from England who was by then already two years old. If you would like to object to this rejection, please do so (politely!) in the appropriate thread in the suggestions and complaints forum. Do not e-mail moderators directly about this. Эээ ...мм.. а с чего вдруг решил, что смысла нет спрашивать альбом?